I don’t know whether you really need to render the perimeter of forests. Surely there could be a clear border in nature between a forest and some other area but that isn’t always the case. Traditional maps tend to show the woods (with abstract tree symbols), and when there’s a clear border – only then – show a line between woods and and other features such as fiels etc. Looking at the second image of your post, it could actually be better not to render a border between woods and everything else. The tree symbols themselvels are enough of a mark of woods and the line can easily be mistaken for a contour. But anyways, this looks really great. It’s a cartographical choice really – with the translucent hint within the forest area it looked a mess not having a peripheral border – it was confusing to the eye. Hope you’re going to give us mere mortals a primer on how to do the relief shading. Now the shading’s there, I think you could probably turn off the actual contours on the small scale maps – say, zoom 11 and below; the dark green tends to overpower the light grey of the (non-cycle route) minor roads. Hey Andy. Just wondering if you know why Australia is the only region which has not been updated with the new rendering rules. The old green lines are still showing. Will this weeks weekly refresh rectify this, along with the lack of low scale coverage in the major cities. Thanks. Luke W – the lack of hillshading is an embarrassing logic failure in the code (works fine for north of the equator…) so that’ll get fixed this week. As for the cities, you’ll need to tell me which ones have significant cycle features in OSM and I can add them – but be aware the zoom levels are limited all over the world, not just in Australia. These are gorgeous, esp. the second one down on the page. Hi, it’s looking very good. I noticed there’s a weird bermuda triangle like thing over the west coast of Scotland. It looks like the land is sea and vice versa. Regarding cycle lane casings: will you soon be able to render casing correctly for a cycle lane that is on only one side of the road? Crossings: The round blob was a good start but isn’t very intuitive. Could you try putting a pinch point in the road somehow, or a line across the road. I think these would be more understandable. dave – the triangle thing is a coastline bug – these things usually come and go as the underlying data changes. Peter – ah, the path/road debate. Personally I’m not seeing much advantage to using them, but if they become popular enough they’ll end up in there somehow. Most likely Dave Stubbs’ osm mangling extension for osmosis will come in handy to stop the filter rules becoming insane. Regarding casings – firstly no, there’s no way to render asymmetrically in mapnik, as far as I’m aware. And anyway, there’s no way to tag which side of the road the lane is on. At best you could assume opposite_lane is on the side of the road you would expect oncoming traffic from – but which side is that? Crossings – they could get a revamp, but until someone comes up with a way of rotating pointsymbolizers based on a way (i.e. the canal lock problem Steve Chilton described at SOTM) then any symbol needs to be either “upright” or rotationally symmetric. Really, really interested in this project. How are you guys collaborating on developing this. I’ve been lending my neo out to other developers/marketeers in the hope of enticing a few more people to try it out. I can’t wait to get it back this week and try out this software. I’ll be putting up lots of cycle routes. One I keep forgetting to mention: when a way is both NCN and RCN, the colouring should be red, not blue, I guess. It seems to vary at present: and at the same time, it’s fairly common to see the line in one colour but the ‘shield’ in another, which looks a bit weird. NCN68/RCN20 north-east of Kendal is a good example. Andy – Glad to see that you’re interested. Most of your questions will be answered by finding out about the OpenStreetMap project – the cycle map is built on OSM data as its foundation. Richard – Absolutely, at the moment at low zoom the cycle routes are drawn in the order they are returned from the db – so it’s a bit sporadic. I’ll try to order them so that they are drawn deterministically. I must look into how to update the maps for my area to participate !! 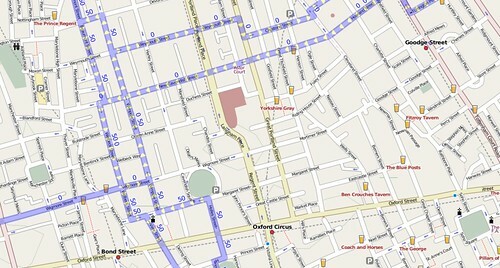 My pocket GPS-PDA supports OpenStreetMaps and it will download the maps via WiFi, that’s really useful. 0 – Forbidden to cyclists, or really dangerous road : highways, speedways, etc. 1 – Dangerous : road with lots of traffic and no bike lane. Or, dangerous blind intersections, multiple obstacles on bike lane like bollards, etc. 2 – Average : Your average, narrow city street (50 km/h) with traffic and no bike lane, where width is not enough for safe overtaking of a cyclist. 3 – Rather Safe : a street wide enough for cars to safely overtake cyclists, or perhaps with a slightly narrow bike lane. 3 – Safe : Any road/street with very very low traffic, or a with a good wide bike lane. 4 – Really safe : Where you’d go cycling with your 6 year old children, no cars, good visibility. For instance, a dedicated bike road, a road inside a park, etc. This way, a cyclist could build a route, perhaps considering a detour to avoid a non bike-friendly section of road. The idea being that depending on the type of bike you have, you can select which route to use. For instance you have a road bike, you’ll only want to use types 4-6 whereas if you have a hybrid you’ll also use type 3 and bits of 2, and if you have a full suspension MTB you’ll use them all perhaps. If you OSM wizards are interested by the idea I can write a detailed help page with examples and pictures to allow people to rate the cyclability of roads. peufeu – I think you need some more practise with OSM first – we do things quite differently from many other sites. Because we have full access to the underlying geodata we don’t need to “summarize” things into a fixed scale – we can specifically mark features like bike lanes and surfaces on an individual basis. It then lets any consumer of the data, like my map or a routing program or a different website, choose how to combine those objective facts into a subjective measure of cyclability. 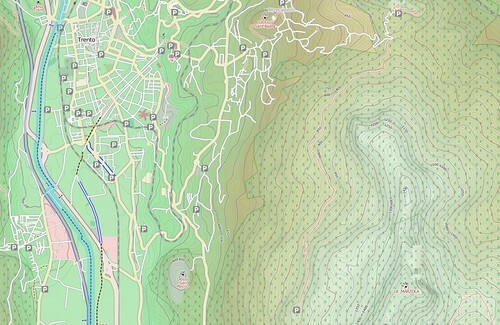 Have a go with OSM, and you’ll see what I mean. Hehe, your feature made me so enthusiastic that I had to talk before thinking, lol. peufeu: Though users are free to use any tags they want, there’s a list of the most commonly used keys and values on the OSM wiki – it’s called ‘Map Features’. It’s not the be-all and end-all of OSM tagging, but it’s a useful resource. At present the surface tagging hasn’t been well developed, so if you’d like to start a discussion and make some suggestions, go for it! The contour shading works really well but it seems to get turned off at high zoom levels. There could be a technical reason for this (eg processing power increase), but if not, would it be worth colouring in the higher zoom levels to see what the results are like? I’ve looked at the paths I added on Guernsey recently (see http://www.opencyclemap.org/?zoom=14&lat=49.4279&lon=-2.53175&layers=B000) and I think they’d look good with coloured relief! Mark – absolutely. It’s just that mapnik doesn’t yet do raster-source interpolation (or rather it just does nearest-neighbour) so when it’s turned on at high zoom you get giant pixelated squares – and it looks pretty terrible! I’m sure mapnik will get some smoothing at some point soon. So that’s how you’ve done it! I had presumed you’d drawn the contours then filled in space between them in different colours, in which case colouring in at higher zoom levels may have been trivial. On the highest zoom that is still coloured (see my link above) you can see the nearest-neighbour interpolation if you look carefully, so I can imaging what it would look like if zoomed in even more. It would be good if the height data went to zero at the coastline – I wonder if anyone has linked the OSM coastline data with the SRTM data to force it to be correct (this would necessitate some smoothing at the edges of course). Streets, Footways and Path (and maybe all other Objects) with bicycle=yes should be highlighted. Streets with cycleway=track should be highlighted. How should i tag a Pub with free wifi? I exported the cycle map to .img format för my garmin and it turned out good. Bu hos do I do to export the hill contours? Srtm2Osm??? 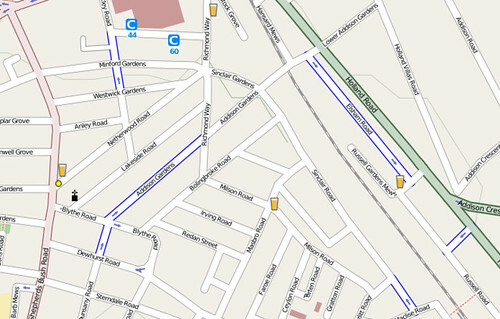 Is there a way of rendering contra-flow cycle lanes as the northern end of Gilston Road in http://www.opencyclemap.org/?zoom=18&lat=51.48811&lon=-0.18287&layers=B000 – that part of Gilston Road is one-way northbound for motorists, but there is a southbound cycle lane. 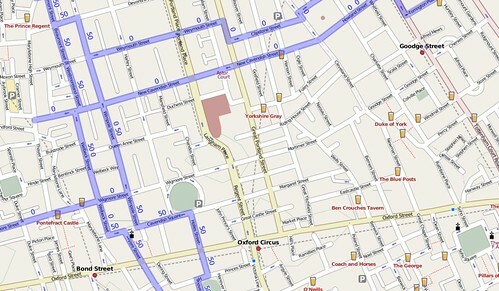 The map appears to show a cycle lane in a one-way street – it looks as though the cycle lane is the same direction as the traffic. 1. At closer zoom levels it’s frequently impossible to tell if the road/way goes downhill or uphill, as the altitude tags aren’t relative to the current view. 2. 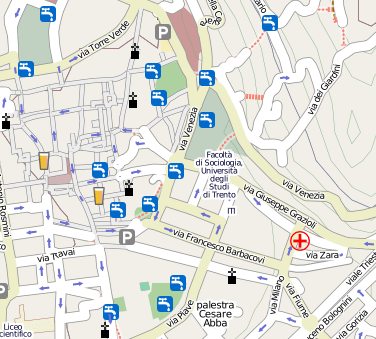 Why don’t Cycle Map render the “highway=PATH” OSM-tag? Many “paths” are good and desirable for biking. Question: How did you render hillshading for such a large area (whole world)? Did you point the mapnik tiler to dynamically generated osm.xml files, each of which pointed then to an area-specific GeoTIFF? Could you please include “highway=path”, at least those which also have “bicycle=yes” or “bicycle=designated”? This seems to be the recommended tag for ways in germany which can and should be used by bicycle. So without it the opencyclemap is nearly useless in germany.